Free Cone Day has been happening each year at Ben & Jerry's around the country and beyond since 1979 and is still going on strong, with larger and larger crowds each year. There are absolutely no strings attached to get your free cone and there's no purchase necessary. Ben & Jerry's does this promotion annually in the spring to show how much they love and support their customers. Last year, Ben & Jerry’s gave away over 1 million scoops! Ben & Jerry's Free Cone Day 2019 is on Tuesday, April 9, 2019, from 12:00 p.m. to 8:00 p.m. This once a year event is held every year in the spring and anyone who stops in on Free Cone Day will get a free single scoop ice cream cone in their choice of flavor. There's a limit of one cone per person but you are welcome to bring in everyone in the family to get their own free ice cream cone. Most Ben & Jerry’s stores participate in Free Cone Day each year, and you can easily check to see if your nearest location is taking part. You can find out which Ben & Jerry's are participating in the Free Cone Day by visiting the Scoop Shop Locator. Enter your address or zip code and be sure to check the box before Participate Free Cone Day. Click the Search button and you'll see a list of Ben & Jerry's near you that are participating in Free Cone Day. If in doubt, give your local scoop shop a call to see if they’ll be giving out free cones this April. Free Cone Day has quite an interesting history that's worth a read. It started at just one shop in 1979 and now has turned into an unofficial holiday each spring. Each year Ben & Jerry's supports a cause during their free cone day, and this year it's Justice ReMix'd. If you’re not sure what flavor you’d like to get on your free cone, Ben & Jerry’s has a quiz that will help you choose a flavor. Answer 11 questions and you'll get a suggestion on a flavor you might like. You might also want to check out the top 10 Ben & Jerry's ice cream flavors to make a safe bet on trying something that you're going to love. 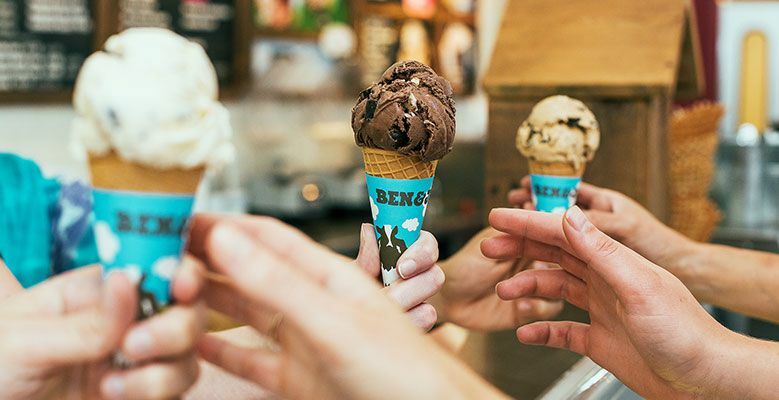 There are a few ways you can get social with Ben and Jerry's Free Cone Day. Ben and Jerry's have set up a Facebook event so you can RSVP to Free Cone Day and share the event with all your Facebook friends. You can also post all your Free Cone Day photos to Instagram with #FreeConeDay. Your photo might even be featured on the Ben & Jerry's website. While you're in line, Ben & Jerry's has some suggestions on how to pass the time in line. The lines can get long on Free Cone Day but they move fast. Those scoop shop employees are all ready to get you your free ice cream and you'll walk out of there with a smile on your face. Did you know this is just one of the times a year that you can get free ice cream? Pick some up some this year at Dairy Queen and Haagen-Dazs.